Park Square Barristers was formed in 2015 as the result of a merger between Sovereign Chambers and No 6, Leeds, creating one of the largest sets on the North Eastern Circuit. This page provides brief histories of No 6 and of Sovereign Chambers, and also of the listed building occupied by Park Square Barristers at 6, Park Square East. Back in the 1920s, it was very difficult for minorities and women to join many clubs and institutions, including the Bar – which was dominated by the privately educated, affluent and traditional elites in society. When a young Orthodox Jew named Alter Max Hurwitz was unable to secure a tenancy anywhere (despite his excellent academic pedigree and his pupillage in Leeds), he simply set up on his own in a building called Vince’s Chambers on the Headrow, opposite the Town Hall. In the 1960s, the chambers moved to 2 rooms at 46 Park Square, and in the 1970s became Westminster Bank Chambers (above the Westminster Bank) on the north-west corner of Park Square. It came to be known (not always affectionately) as the ‘Jewish Chambers’. It was indeed initially dominated by its Jewish members, including Alter’s son Vivian, Arthur Myerson, Harry Ognall, Geoffrey Rivlin, Paul Hoffman and Louise Godfrey, all of whom reached the highest levels in their profession as Queen’s Counsel and judges. Miss Godfrey was the first woman to lead the North Eastern Circuit and the first woman to be appointed Recorder in Leeds. However, Hurwitz also welcomed minorities from all sections of society who were shunned elsewhere. By the 1970s, it had become a diverse set of 12, unlike any other in the square – Peter Das (a prince of the Raj), practised there; the brilliant but eccentric Lionel Scott was head of chambers; and the majority of members were state-educated Northerners (quite unlike the public image of the stereotypical barrister). The welcoming, inclusive and friendly tradition continued, and the chambers was among the first in the region to admit a Black member. The next move was to 25 Park Square in the 1980s, which became known as Sovereign Chambers in the 1990s. In 2004, 30 Park Square Chambers merged with Sovereign Chambers and, a year later, moved into 25 Park Square. The merged set then moved as Sovereign Chambers to 46 Park Place. At the time of the merger with No 6 in 2015, Sovereign Chambers had grown to over 50 members. Throughout its history, it had continued to follow the tradition set by Alter Hurwitz: selecting members fairly and objectively, on merit – regardless of gender, religion, racial origin, social background, or sexual orientation. The forerunner of No 6 was first established at 12 Piccadilly, Bradford in around 1893/4, initially as a sole practitioner by Richard (‘Dickie’) Watson. However, by 1954 its members had moved to 6 Park Square, in the heart of Leeds’ legal quarter. By 1962 there were 6 tenants there: Gilbert Hartley, Alastair Sharp, Douglas Forrester-Paton (a distinguished member of the RAF), Max Gosnay, A B Boyle and Miss A Symons, who was the first woman to become a member of chambers and one of very few women practising as a barrister at that time. By 1978, the head of chambers was Arthur Hutchinson and there were some 16 other full members (mostly criminal practitioners) plus 4 door tenants from Liverpool, who undertook chancery work. In those days, the consequences of the relatively recent move from Bradford were still apparent – most work emanated from Bradford, Huddersfield and Halifax solicitors. Chambers was still run on the traditional model, employing an old-style senior clerk in the form of Charles Easton, who ruled with an iron discipline. Desks were assigned in order of seniority: every time someone left to go on the bench (almost exclusively the way out! ), the remaining members moved up a desk until, eventually, the head of chambers and deputy reached the plum position – the front window overlooking Park Square. Every day was punctuated by the afternoon ‘tea ceremony’: at 3.30 prompt, all members present would assemble in the senior members’ room and it fell to the most junior member present to serve the tea, which had to be done strictly in order of seniority. It had its plus points – it was a great opportunity for pupils and junior tenants to listen to pearls of wisdom from their seniors, though tempered with the fear that someone would want to discuss a quantum, at which point it fell to the most junior to venture the first opinion! In the following years, No 6 expanded consistently. As other tenants moved out of the building, the chambers acquired additional accommodation so that, by the late 1990s, it occupied the whole of the building. This coincided with the decision in 1998 to break with the traditional administrative model and to appoint a practice director rather than a senior clerk. At the same time, No 6 became the first chambers on circuit to re-organise its administration by incorporating No 6 Limited as a service company. Under the stewardship of Tim Collins there was a significant expansion in membership – for the first time, significant numbers of barristers joined chambers from other sets rather than starting there as pupils. By the time Tim left in 2013, No 6 had well over 50 tenants. Members of No 6 increasingly attained the highest professional achievements. Arthur Hutchinson took silk in the late 1970s and became the first circuit QC for many years to remain with his chambers after doing so (it had become the practice on taking silk to move either to a London set or what was known as the “silks’ chambers”, then at No 2 Park Square). He was followed by others, including Stephen Williamson QC (who became leader of the North Eastern Circuit) and one of chambers’ great characters, Shaun Spencer QC. There were regular appointments to silk and to the Circuit Bench – to the extent that, relatively recently, there were 4 appointments to the Bench within the space of a year. No 6 gained its second high court judge in 2008, when Eleanor Hamilton QC was appointed to the Family Division (under her married name, Mrs Justice Eleanor King). In 2014, she provided another first for chambers with her promotion to the Court of Appeal. In the same month, the former head of chambers, HH Judge James Goss QC (the Recorder of Newcastle) was promoted to the High Court bench. In 2015, by now with 65 members, No 6 once again found itself at the forefront of developments in the way the Bar operates, poised to merge with Sovereign Chambers. The building, now listed, is believed to date from 1790. Although there was a barristers’ chambers at 6 Park Square in the Victorian era, this was not the direct ancestor of No 6. That other chambers may have been established in the early 1880s (since in 1878 the building was occupied by a ‘drysalter’). In the 1882 Post Office Directory, 4 barristers were listed as occupying the building, along with a physician, Thomas Clifford Allbut. However, by 1909, there was no longer a chambers in the building, 2 of its barristers having moved to 7 Park Square to join barristers there. No further barristers are listed at the address until the 1950s, showing a clear break in the lineage. Throughout the inter-war period the premises seems to have had a variety of tenants, including Louis Godlove (solicitor) and, at one time, a cigar company (which continued even after No 6 moved in). Even after No 6 took up residence in around 1953, the building remained in multiple occupation. Louis Godlove was still there, but other tenants included Milne Booth & Co, accountants (ancestors of the current Armstrong Watson), and a small firm which mysteriously disappeared one lunchtime, just ahead of the bailiffs! As late as the 1970s, No 6 Chambers was confined to the 5 rooms at the front of the first floor and 2 rooms at the rear, facing onto Park Cross Street. 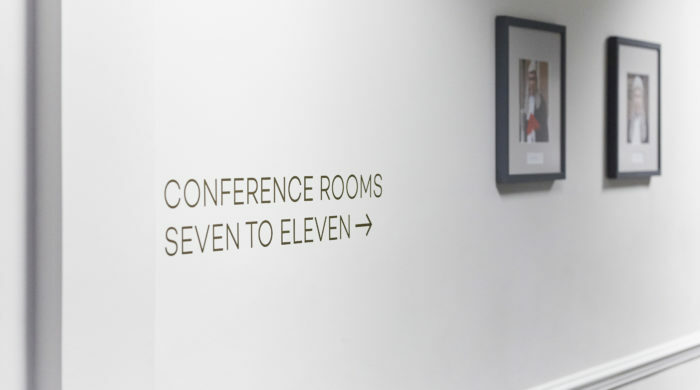 Over time, No 6 took over the entire building, which is now Grade-II listed, and it was extensively refurbished in 2015 in advance of the merger with Sovereign Chambers. In February 2015, the tenants and staff at No 6 welcomed the Sovereign Chambers team, arriving from their old home at 46 Park Place, a short distance away.